Zakopane is the city at the highest elevation above the sea level in Poland and at the same time the biggest located in the surroundings of the Tatra Mountains. It is a large winter sports center, here take place the very popular ski jumping competitions. The city limits are surrounded by the Tatra National Park. At the beginning we are going to Chocholow, a visit to this place will take us back to the 19th century. That's when most of the local huts were constructed in Highlander style, and despite the course of the years they have kept their charm and are still eye-catching. Chochołów is called the living open-air museum of Podhale. The program of the trip also includes entrance to the Tatra Museum in Krupówki, where, thanks to permanent and temporary exhibitions, you can get to know the history of the region. Riding by funicular train to Gubałówka is undoubtedly one of the biggest attractions during a trip to Zakopane. The view from the top situated 1120 m above sea level allows you to admire the entire panorama of Zakopane and the Tatra Mountains, both in the Polish and Slovak side. During the trip, there is also some free time planned, which you can spend on the Krupówki strip loved by tourists or go to a restaurant to taste the regional cuisine. We offer trips to Zakopane in the PRIVATE TOUR option. We created this option to satisfy the most demanding of tourists. In addition to choosing the start and end times of the trip, a private comfort-class car with a private driver, the undoubted advantage of this version is the possibility of a private guided tour of Zakopane in a previously chosen language. In this case, please make a reservation at least two days in advance. Only then we can guarantee full flexibility due to the ever rising interest in the capital of the Tatra mountains. After the sightseeing program, there is free time on site during which we recommend you try the original local sheep cheese (oscypek) available in numerous places throughout Zakopane. After the trip, our driver will take you to your chosen destination in Krakow, be it a restaurant where you can spend a pleasant evening/afternoon or another of the many attractions that Krakow has to offer. This option for an additional cost also allows you to extend the driver's services until the end of the day. Please provide this information at the time of booking so that we can fully tailor the offer to your needs. The trip along with travel times takes about 9 hours. We can pick you up from one of the six points specified on the map (map available below the description and in the link http://tinyurl.com/yachy3bb). Throughout the trip, we are accompanied by an audio guide in a previously chosen language. Getting to Zakopane from Krakow takes about two and a half hours. Along the way, we stop in the oldest village of Małopolska, Chochołów, where you can admire the original wooden highlander huts preserved from the last century. The tour takes place in groups of 8 up to a maximum of 24 people. After a short stop, we head further towards the centre of Zakopane. On the way, we drive through the Chochołowska and Koscielisko valleys where you can see how the original sheep's cheese from this region called oscypek is made. 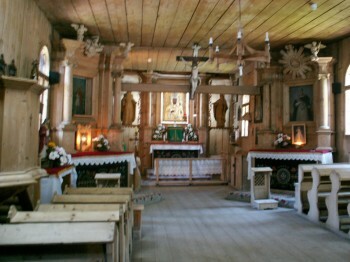 Next, we visit the Sanctuary on Krzeptówki then head straight to Krupówki. Located in the centre of Zakopane just below the Gubałówka hill from where there is an impressive view of the Tatra mountain range. Further points of the program will be the Chapel of Gąsienica and the Cemetery of the Merited in Brzyk, the ski jump and Jaszczurówka. On the 2 hour drive back to Krakow, we will see Bukowina and hear a bit about its history. Visitors most often choose this option due to the price as well as the possibility of visiting with an audio guide in various languages. The price includes pickup from your address or one of the fixed meeting points, all tickets and admission fees, a professional audio guide in a previously chosen language and a drink for each participant. The tour is possible from Wednesday to Sunday (every Monday and Tuesday it is not possible to visit most museums). The temperature in Zakopane and its surroundings is usually 3-5 degrees Celsius less than in Krakow. People with disabilities can rent a wheelchair for free in both museums but are obliged to have a guardian who will help them navigate. Drivers are not able to help throughout the duration of the trip. This solution is also available in the Private Tour option. In the Private Tour option, it is possible to book an on-site guide in a given language for an additional fee. The guided visit usually lasts up to 4 hours and includes the centre and the surroundings of Zakopane. We tailor the sightseeing programme individually after consulting with you.